The Nintendo Switch has a wide array of game genres to pick and choose from. However, the Switch is also relatively new, meaning it doesn’t have the same expansive collection of games available as other competing platforms such as the Xbox, PlayStation, or PC. Luckily, developers of all game types have forayed into the world of the masterful Switch, allowing their games to be played anytime and anywhere. Obviously that is a strong business decision and I cannot fathom why every developer hasn’t provided us with that luxury. Lest we wait, here are two games that are on the Switch, and here’s how they fare on the handheld versus their mother platform. I’ve said it before and I’ll say it again—Stardew Valley is one of the best games out there right now. I love it with my whole heart (and hoe, pickaxe, and shovel). Originally on Steam, the mechanics are smooth and I found very few actual issues with the gameplay. On the Switch, however, I find that any game with meticulous precision is a wee bit difficult to navigate with the Joy-Con. Aiming directly upon the intended block is as challenging as it is with a mouse. Another downfall is that while multiplayer on PC is free, to play multiplayer on the Switch requires the Nintendo Switch Online subscription. A plus to Stardew Valley on the Switch is that the game is very relaxing, and the Switch is the perfect console for snuggling up in a blanket and playing a cool-down game. I didn’t expect Minecraft to be much better than the mobile Pocket Edition. I was clearly fooled by the handheld’s tiny screen because boy, was I wrong. 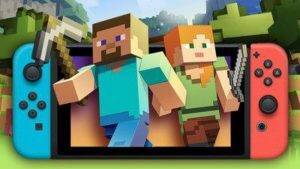 While Minecraft is undoubtedly superior on PC due to the sheer amount of technical advancements made on its original platform, on the Switch it resembles the Xbox version more, which is not an insult. The vision and movement controls on their own are smooth and operate well, but together they create a jankier feel to the game that reminds me more of a shooter than a sandbox. Again, I think this game would be good on the Switch if the intended use is very casual rather than a more competitive approach. I’ve also concluded, after watching my six-year-old brother play Minecraft on the Switch for the first time, that the Switch is a great gateway to understanding controls and coordination in order to progress to harder games or different consoles. Overall, I think the Nintendo Switch does a good job of keeping the integrity of the original games, but for Stardew Valley and Minecraft, I can’t shake the training wheels feel to them. Nonetheless, a portable option to your favourite games is easily enough reason to try them on for size.